Stampin' Up! 's You Make Me Happy image from the Perfect Pennants stamp set was just right for this mini muslin gift bag. This was the make and take project for a recent get-together with my fellow Stampin' Up! demonstrators. I wanted to make something featuring items from the new Occasions catalog and unfortunately had a bad case of creative block. My mind was not cooperating at all. I was getting a big bunch of nada. LOL!!! So the morning of our get-together (around 3am) it finally comes to me. And like most things artistic, when my right brain got going, this project came together quickly. Thank goodness. 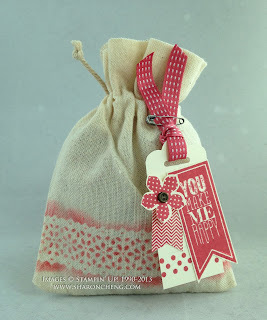 For the trim at the bottom of this bag, I used Stampin' Up! 's Delicate Details Lace Tape as a stencil. The ink and ribbon is Primrose Petals. For other 3D, Party Favor ideas, please visit my Pinterest board.